For one day only: Goodmans serves up more Monday Madness! Earlier this week Goodmans sold 20-inch HDTVs for just £150. After it sold out in less than an hour, Goodmans has now announced that Monday Madness will return every week for the rest of the year. Monday 10 December sees the price of Goodmans' super-slim 80GB HDD Recorder with Twin Digital Freeview Tuners drop to just £49.99. Goodmans says it's a 'bonkers' price and it's not far wrong - that's half the normal retail price. You'll have to be quick though - there's only going to be 50 Goodmans GHDD1785DVBTs available, and the sale starts at 10am on Monday. For a budget box, it's a pretty neat little product. It's fully specified for connecting and recording Freeview digital TV, and what's more it can pause and rewind live TV, so you won't have to miss the last five minutes of the football if you need the loo. 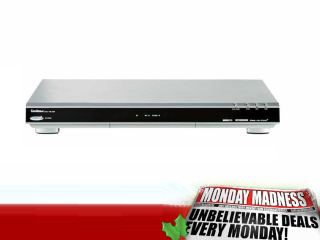 To get your hands on one of these £50 Freeview recorders, log on to www.goodmansdirect.com on Monday.